Due to the fact that the size of our planet is huge, in the same period of time, at different points of the Earth – your local solar time. And to avoid confusion in understanding the question: "So which hour? ", adopted a system of standard time. And the Earth divided into 24 time belts. Reference point took a zero Meridian, from which to the East are hour - zone +1, +2, +3, etc., and to the West: -1, -2, -3, etc, thanks to the time zones, it's fairly easy to determine the desired. Turn on your computer and click on the hour indicator in the lower right corner of the screen. Now, in the opened window, click on the option "Change date and time". And in the new window, choose the option "Change time zone". You will see long list of time zones with a list of cities that apply to them. Of course, here are only the capitals of countries and no small towns. So, if you want to know the time zone of a small town – just find in this list the capital of his country, because, usually, one country has one time zone. Use an ordinary map of the world, which details the average meridians: 0°, 15°, 30°, 45°, 60° etc. the fact is that one time zone is approximately 15°, but not clearly from 0° to 15°, from 15° to 30°, from 30° to 45°, etc., and with an offset that is equal to 7°30. So, in order to determine the boundaries, for example, the time zone UTC+1, it is necessary to hold the line on the right and left of the Meridian 15° East longitude at a distance of 7°30'. In order to determine the time zone of the place, which is located, for example, in the region of 60° West longitude, it is necessary to calculate its position relative to the zero Meridian: 15° – single, 30° or two 45° or three, 60° - four. So 60° West longitude – the time zone UTC-1. 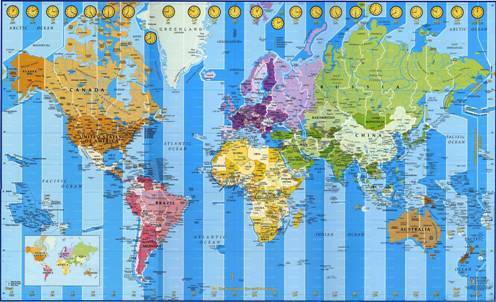 Take advantage of detailed map of time zones. This map is the easiest and most reliable way to determine the time zone a particular point of the globe. As here, to indicate not only the boundaries of each of the 24 time zones, but there is a mark – whether the country goes on daylight saving time. It looks like this: +1(+2), and means that the country refers to the time zone UTC+1, but in the summer, it refers to the time zone UTC+2. Of course, don't forget to take into account that in different hemispheres, summer and winter at different times. Another big plus of this card, the ability to determine whether its different hour zone, as in Russia, or, despite the large area, adopted only one zone in China. Despite the generally accepted system of time zones, in fact, in order to maintain a unified time within a single country or administrative unit, the boundaries of the zones move, so sometimes some time zones supplanted by the next. Determining the time zone, do not forget that in some countries the local time differs from universal time in standard hours, but also 30 or 45 minutes.